Local Eatery becomes a drinking man's world. Chef Jason Thrasher and owner Kyle Sinclair bring Irish and American flavors to the Fan at their new business, the Local Eatery and Pub. 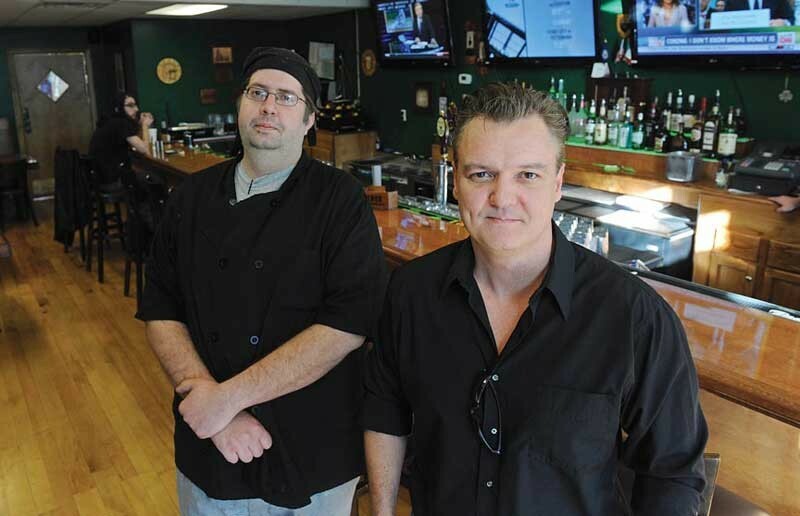 It took almost a month after opening, but when the Local Eatery and Pub finally got its liquor license Dec. 2, the business could give customers what they wanted: premium English and Irish beers and some locally brewed selections, along with high-end whiskeys at the bar. The pub is owned by Kyle Sinclair, known for operating a series of Shockoe Bottom bars. This project at 1106 W. Main St. was a hookah bar near campus that caught fire last spring. Now, with chef Jason Thrasher (formerly of Tarrant’s Café) in the kitchen, it’s transformed into a drinking man’s world with hearty food and the classic sports-on-screen accompaniments. Irish stew, shepherd’s pie, fish and chips, Scotch eggs and cottage pie hearken to the traditional pub food of Sinclair’s roots. For American tastes, there’s beef stroganoff and variations on Reubens, burgers and other meaty sandwiches. Vegan and vegetarian options are available, and entrees are priced from $6-$12. Dessert straddles the continents, with apple bread pudding in Powers whiskey sauce already a clear crowd favorite, Thrasher says. The Local serves lunch weekdays, including box lunches for takeout, with dinner and bar hours nightly. 358-1862. Wine with wisdom: C’est Le Vin offers a wine and food-pairing expo by reservation on Dec. 16, beginning at 5:30 p.m. For a $10 fee, guests will sample 20 wines, talk with the shop’s owners and importers, and learn which foods taste best with which wines. The wine boutique is located at 15 N. 17th St. and has an unusual selection of gifts for the oenophile and party-giver. cestlevin.com. Arcadia: Steaks, seafood, small plates, sides in new Shockoe Bottom restaurant with chef Matthew Tlusty. Lunch Tuesday-Friday, dinner Tuesday-Saturday, Sunday brunch 11 a.m.-3 p.m. 1700 E. Main St. 417-4005. arcadiarichmond.com. Pasture: Urban gastro-pub with grazing menu from chef Jason Alley; oysters, burgers, fried chicken, desserts and new-Southern classics in downtown dining room. Monday-Saturday from 4 p.m. 416 E. Grace St. 780-0416. pasturerva.com. Peacock’s Pantry: Fine dining with seafood, steaks, cassoulet, desserts, wines from new chef and owner Elizabeth Lee in decorative, intimate space. Dinner Thursday-Sunday; weekend brunch. 1731 W. Main St. 732-3333. Margarita’s Cantina: Burritos, quesadillas, margaritas in many flavors, $6 weekday lunch specials. Open daily for lunch, dinner and bar. 101-107 N. 18th St. 225-0331. C Street: Breakfast and lunch fare with French twists in Carytown from chef Graham Reeves. Egg of the day with root vegetable hash; pastries and Rostov’s coffee; salads, sandwiches, heartier entrees, outdoor dining on heated patio. Monday through Saturday, 9 a.m.-3 p.m. 3325 W. Cary St. 355-2200. cstreetrva.com. Mansion 526: Restored Jackson Ward residence with separate speak-easy; Southeastern comfort food at moderate price points. Pork, chicken and waffles, shrimp and grits, seafood. Lunch weekdays, dinner and bar Monday through Saturday. 526 N. Second St. 308-2913. Olio: New downtown location for gourmet sandwiches, salads, quality deli foods. Espresso bar and breakfast sandwiches weekdays 7-10 a.m.; lunch 11 a.m.-3 p.m. 600 E. Main St. 775-9597. oliorichmond.com. Hard Shell at Bellgrade: Midlothian sibling of longtime Shockoe steak and seafood spot; full bar, outdoor dining, classic menu. Open nightly from 4. 11400 W. Huguenot Road. 464-1476. Carytown Bistro: New ownership for former Betsy’s and Bin 22; house-baked pastries, breakfast and lunch sandwiches, panini, coffees, lemonade. Local art and live music, Craft beers, wine. Outdoor patio, friendly service. Open daily. 26 S. Auburn Ave. 340-0272.